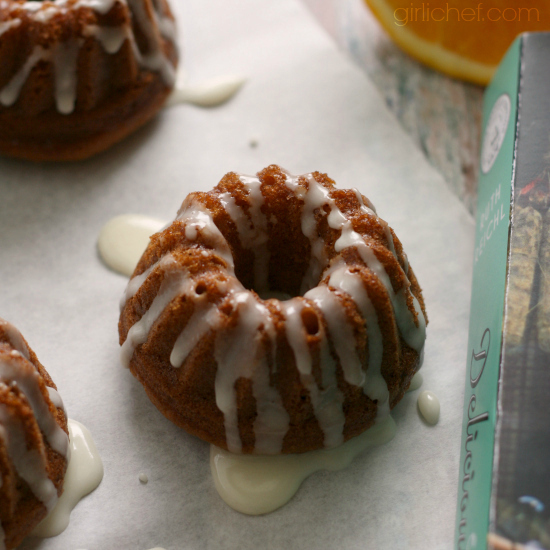 Gingerbread w/ Orange & Bourbon inspired by Delicious! In 1998, I picked up Tender at the Bone, and didn't put it down until I'd finished it. I'd heard of Ruth Reichl before then; I may have even read a thing or two and enjoyed it - an article, a cookbook. But I devoured Tender at the Bone with the voraciousness that only a person with permanent food-on-the-brain can. And Ruth Reichl's place in the top of my favorite authors list was cemented. Now, it's sort of a funny story. This was before I started blogging or writing (publicly). I saw a sign up at my local library that the (then) new release would be their book club pick. I'd never participated in a book club before. When the day arrived, I toted in my already well-worn copy of the book, a pencil, and a few pages of notes. All about food. How could one read Tender at the Bone without an urge to head into the kitchen? I was about to find out. To my utter shock and dismay, not a single one of the other 7 or 8 ladies mentioned THE FOOD even one time. Not once. Somehow, it didn't seem to even warrant a blip on their radar. I waited expectantly. And then, after waiting for all of them to finish sharing their thoughts, I spoke. Or maybe I gushed. 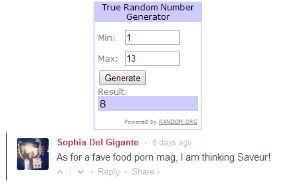 Food IS my favorite subject, after all. I was seriously dumbstruck when all of these older (than me) ladies told me that they didn't even think about the food references. What was there to think about? It just was. That marked another notch in my "growing up" belt. Of course not everybody sees the world the way I do. Sheesh. But, on to Delicious! - aka Reichl's first foray into fiction writing. It's a mix of food and historical fiction, with a side of mystery thrown in. But most of all, it's food. Reichl is a food writer through and through. This is the story of Billie (who, in description, conjurs up Ruth herself in her wide smile, brown eyes, and mane of dark hair) who, after a tragedy, flees California and college to take an "assistant" job at the most iconic food magazine in New York, Delicious!. But she also happens to have the best palate that anyone has ever witnessed, a passion for food and history, and the ability to capture her new world in words. She has just started to feel a bit comfortable when the magazine is shut-down. And then she discovers a little bit of magic from the past. Letters from a young girl named Lulu, written during World War II to the great James Beard (who once worked at Delicious! himself). She embarks on a quest to track down all of the letters, and then Lulu herself. Along the way, she finds her passion, makes new friends, finds love, becomes comfortable in her own skin, and learns to forgive herself. Dare I say that she was able to make a notch in her very own "growing up" belt? And I just realized that I haven't even mentioned the food. THE FOOD! I don't know where to begin. It all started with gingerbread. Billie and Genie's quest to recreate the perfect gingerbread that their mom made when she was alive. So, immediately I started craving gingerbread. But as the story went on, my mind went through so many menu changes. For a while, I was sure that I'd be making oysters. And then I was postive a souffle would be on my table...until the mention of Yorkshire Pudding. Wait! Dainty cupcakes that taste of delicate orange blossom water, rosewater, or saffron - yes, that's it! How about a nice salad of kale ribbons tossed with sweet currants and toasted pine nuts? Oh yes. But then again, there's ice cream, shaken to creamy perfection by hand. Huge popovers, cold butter, and great slabs of steak. Cold chicken fragrant with lemon and garlic, hard-boiled eggs, jars of homemade pickles. Fresh lemonade. Brownies. Fresh Mozzarella. Cheeses, meats, olives, cocktails. Pancakes. Pumpkin gnocchi. Sauteed pumpkin leaves. War-time food. Those are just a few of food references that decorate the pages of this book. But then everything came full circle. I knew, without a doubt, that I was making gingerbread. I creamed the sugar into the butter, watching two substances become one. I cracked the first egg, mesmerized by the deep marigold color of the yolk. I was all set to try and recreate my own version of Billie's beloved gingerbread when I turned the page and found the recipe written right there for me. I still changed it up a bit. Not much. It was moist, tender, and absolutely every bit as comforting as the story on the pages of Delicious! I'm definitely looking forward to Reichl's next book - fiction or non. 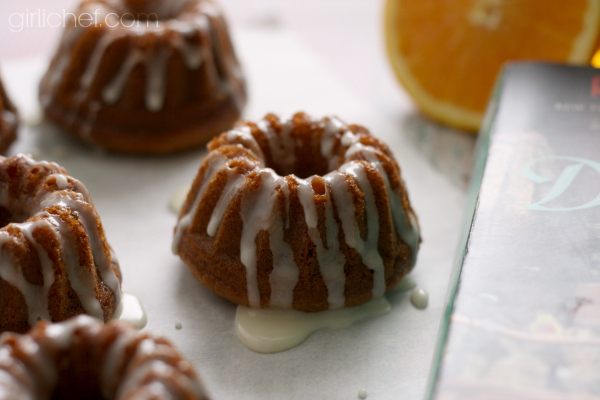 These orange-accented mini gingerbread bundt cakes have a spicy kick from the addition of fresh ginger and freshly ground black pepper; finished with a bourbon soak and an orange glaze. Set a medium-mesh strainer over a small bowl. Add the flour, baking powder, baking soda, salt, and spices in and sift them into the bowl; set aside. Whisk the yogurt and eggs together in anothe small bowl; set aside. Place the butter and sugar into a large bowl and, using a hand-mixer, cream them together until light and fluffy, ~3 minutes. Beat in the grated ginger and orange zest. Beat in the dry mixture, in two additions, alternating with the egg mixture, until combined. 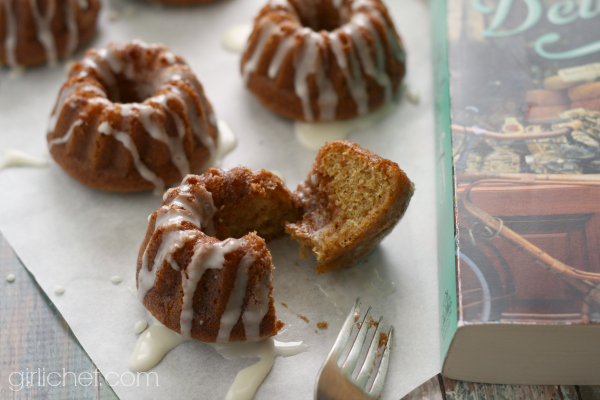 Spoon the batter into 11 slots in a nonstick mini bundt pan mold. Slide into preheated oven and bake for 18-20 minutes, until golden and a toothpick inserted in the thick part of one comes out clean. Just before the cakes come out of the oven, combine the bourbon and sugar in a small saucepan and bring to a boil until reduced a little (so that you have about 1/3 cup left). This only takes about a minute. As soon as the pan comes out of the oven, brush the bottoms of the cakes with about half of the bourbon syrup. Pop them out of the pan and set them on a wire rack, right side up. Glaze the tops with the remaining syrup. Once the gingerbread cakes have cooled, whisk together the powdered sugar and orange juice until you have the consistency you want (adjust with more or less orange juice or powdered sugar). Drizzle over the top of the cakes and serve. "foodie" read: YES! You can't get much "foodier" than this. synopsis (via tlc book tours): In her New York Times bestselling memoirs Tender at the Bone and Comfort Me with Apples, Ruth Reichl has brilliantly illuminated how food defines us. Now she celebrates this theme in her dazzling fiction debut—a novel of sisters, family ties, and a young woman who must find the courage to let go of the past in order to embrace her own true gifts. 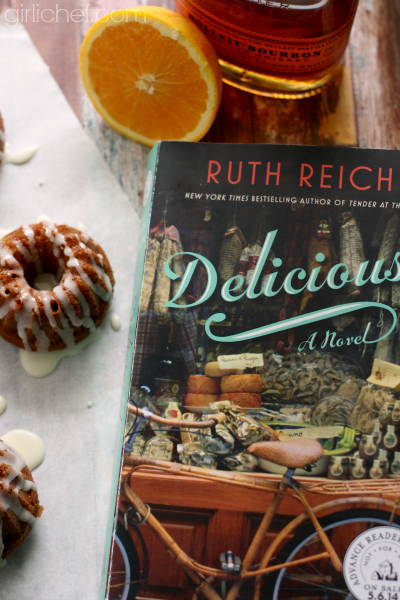 about the author: Ruth Reichl was born and raised in Greenwich Village. She wrote her first cookbook at twenty-one, and went on to be the restaurant critic of both the Los Angeles Times and The New York Times. She was editor-in-chief of Gourmet magazine for ten years. She now lives with her husband in upstate New York. 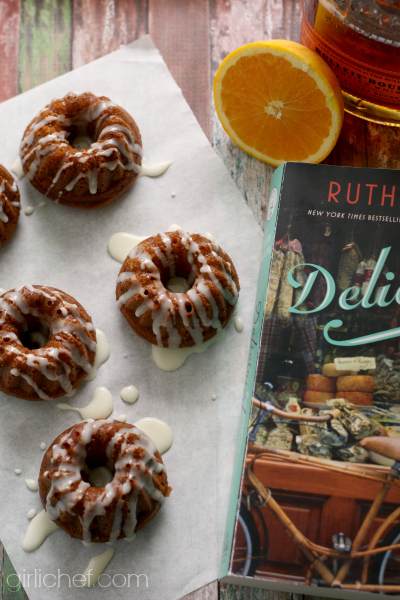 Would you like to win a copy of Delicious!? If so, simply answer this question in the comments section below: What is your favorite food magazine (current or past)? I received an advanced reader's edition of Delicious! for being on this book tour. All opinions stated in this post are my own. This post contains Amazon affiliate links.